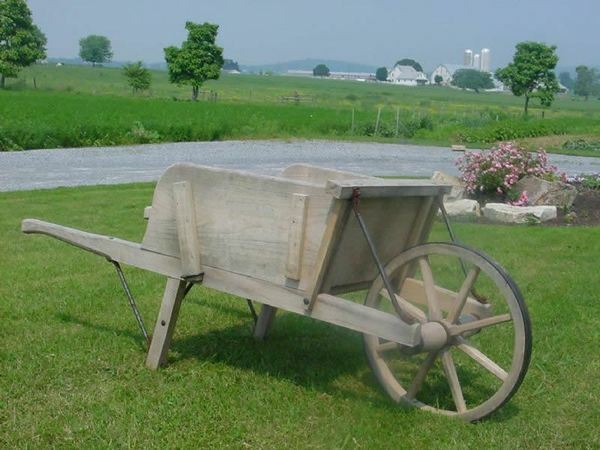 The Amish woodworker that handcrafts our wagons and wheelbarrows is from Pennsylvania and has deep understanding of the value of quality craftsmanship. This wheelbarrow has a rustic looked with the wood left in its natural state un-sanded, added weathering from the natural elements, and unprotected hardware to give an aged, rustic look. This wooden wheelbarrow is the perfect spot for flowers, herbs, and much more! It is guaranteed to bring a beautiful, country feel to your outdoor home decor. The optional galvanized metal liner will guarantee that any wheelbarrows used as planters will stay strong and beautiful through years and years of use. Additionally, you can add the option of having our craftsman hand-paint a custom murals on the sides of the wheelbarrow. Some ideas for murals are wedding date and wishes, scripture quotes, photos of your pet and favorite flowers. Just give one of our sales associates a call to talk about the ideas you have for your custom painted mural. For your convenience, this wheelbarrow is disassembled and carefully packed in a small box to save on shipping costs and storage space. The box is very compact, and the wheelbarrow is wrapped and shrink-wrapped to protect it during the shipping process. It is simple to assemble, and comes with an instruction sheet to walk you through the steps. Call today to get an order started for one of our reproduction quality wheelbarrows, order online using our safe and secure check out or stop by our store in Florida. Have a Merry Christmas... Got the wheelbarrow on time and it is great.. My wife will surely be surprised.. Thanks again for your help..